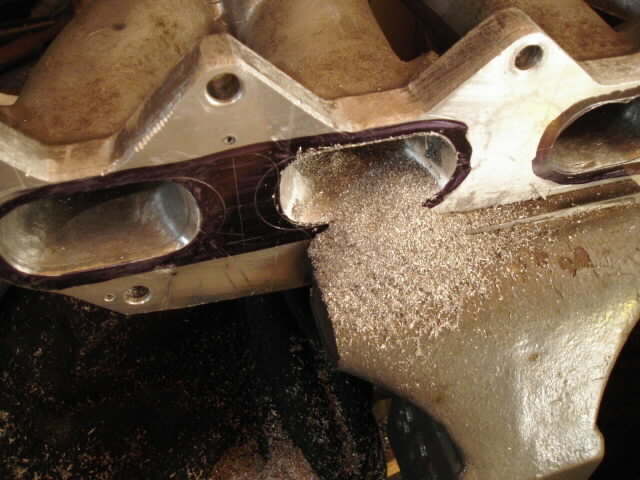 This article details the steps needed to adapt a smallport (late AE92) intake manifold to a bigport (TVIS style) 4AGE cylinder head. Changing to the smallport manifold offers some performance advantages at high RPM. 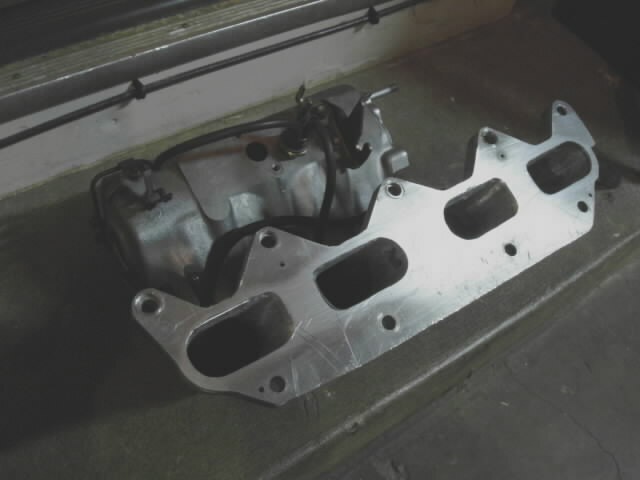 Here are some measurements of the ports at the face of the manifold and head, as well as the dimensions of the gasket windows. The oval scribed just outside the port opening represents the smallport gasket window. Other lines show where I planned to remove material. Smallport manifold, as cast: 26.5 x 46.5mm; 1081 square mm; equivalent to a 37mm ID pipe. The #4 port, left, has been opened up to just inside the smallport gasket’s window. Obviously the smallport manifold’s runners are too narrow for the much wider ports of the bigport head. The bigport manifold is divided into two circular runners, each 30mm in diameter; 30mm ID x 2 = 1414 square mm; equivalent to 42mm ID pipe, about the same area as a gasket-matched smallport manifold. There’s also the bigport manifold’s TVIS plate. On cylinders 1 and 4, one of the two intake runners has the TVIS butterfly shaft through it, but cylinders 2 and 3 have the TVIS shaft running through both of their runners. That shaft is 5mm thick, meaning that there is a 5mm x 30mm obstruction in one or both of each cylinder’s runners. That is a 150 or 300 square mm obstruction, respectively. 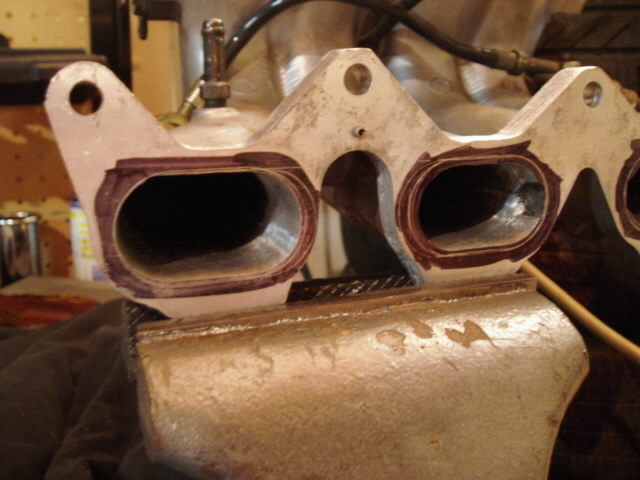 So the “bigger” bigport intake manifold with TVIS has little more cross section than the smallport manifold. 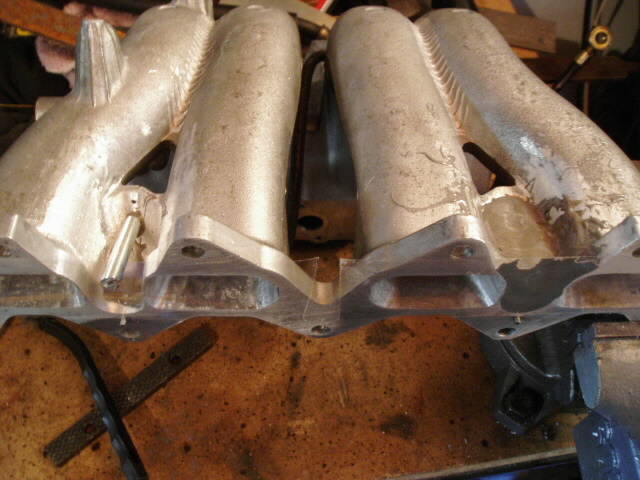 Even if you gut the TVIS plate (remove the butterflies and shaft) and get back to 1414 square mm, each cylinder is still breathing through two small runners, so there is a lot of surface area relative to cross-sectional area. The gasket matched smallport manifold has 97% of the bigport manifold’s cross sectional area, but only 73% of its surface area; it has 32% more cross sectional area, relative to the surface area of the manifold runner, than the bigport manifold. That means less surface friction for the air traveling down the manifold – so, in theory, the smallport manifold can move more air even though it doesn’t have more total port area. There is less boundary layer (air stuck to the port wall) and, theoretically, more air actually moving, inside the smallport manifold. The smallport manifold is misaligned with one side of the bigport head’s intake port by 14mm and might not distribute air evenly to both valves. There isn’t enough meat in the manifold to make it match the bigport head unless you add material between runners 1-2 and 3-4. I ported the manifold out almost to the edge of its flange, making the port about 55mm wide, and port-matched a 1/8″ thick adapter plate to continue the taper toward the side of the port, making the opening about 58mm wide where it meets the head. That is still 7.5mm short of the port wall in the head, but it is much tighter than the 14mm gap we started with (or 16.5mm if the smallport manifold was not gasket matched). In the process of porting the manifold and adapter plate to better match the bigport head. The scribed ovals around the ports show the size and shape of the bigport gasket windows. 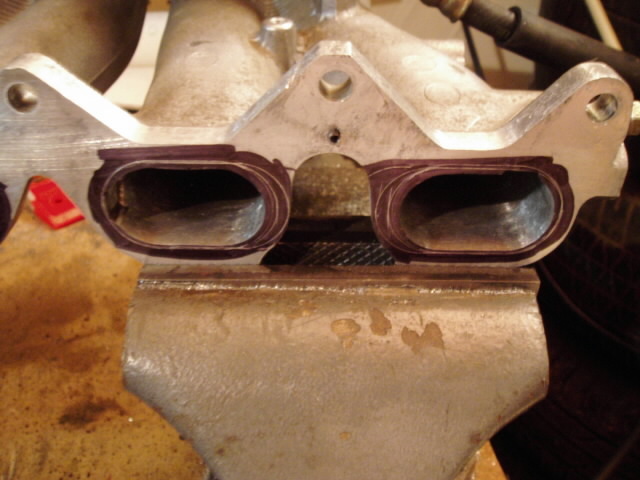 I ported the smallport manifold to the very edge of the flange, and filled the valley between the 1-2 and 3-4 cylinder runners in the manifold with JB weld to support the thin edge of the manifold at the flange. It also provides a better sealing surface for the gasket between the manifold and the adapter plate. A length of Allthread threaded into the web supports it internally, and I roughed up and cleaned the surface thoroughly before pouring in the epoxy. The stock intake manifold is only set up for the stock 55mm throttle body, but I opened it to accommodate a 60mm throttle body if necessary. The 55mm TB is more than enough for the power my engine makes. Here you can see how close to the edge of the casting we got. There isn’t more than about a millimeter of flange on those inner edges. As above, but with the adapter plate in place; much closer now to the shape and size of the bigport ports and gaskets. Notice the threaded rod screwed into the reinforcing web to help anchor the epoxy. Clear packing tape was used to form a dam to keep the epoxy in place while it cured. Both webs now filled with epoxy. The smallport manifold is longer than the bigport by the width of the TVIS plate. Since the smallport manifold doesn’t use TVIS, they are now basically interchangeable. 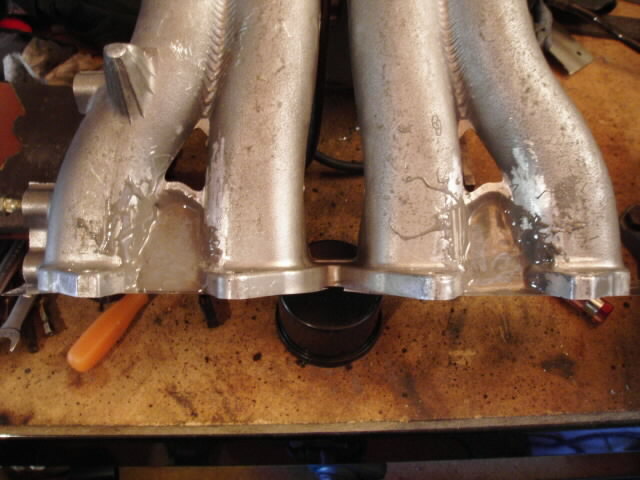 Note the longer runner length in the bigport manifold as a result of the outward curve under the plenum. The smallport’s shorter runners are better for high-rpm cylinder fill, while the longer bigport runners favor (slightly) lower engine speeds. I hate cars sometimes. Just swapping manifolds was more hassle than it should have been. Result: more power over 5000 RPM, with about five horsepower improvement at peak. Power under 5000 RPM was softer. Details are in chapter two of the StreetDyno Tune article in Tuning and Tweaking. Hello I’m curious to do this swap for the rest of racing season until I decide to put a silver top in or redtop I have. So if easy enough keen to use small port manifold on my Bluetop. 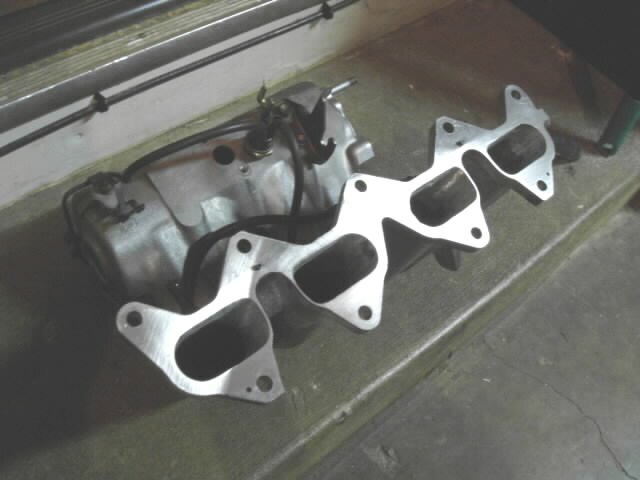 Do you make these plates to sell and do you have to bore out smallport intake manifold to make work or just use a plate? From NZ any advice would be great. I do not make the adapter, but it’s easy enough to make yourself out of 3mm aluminium plate or similar. 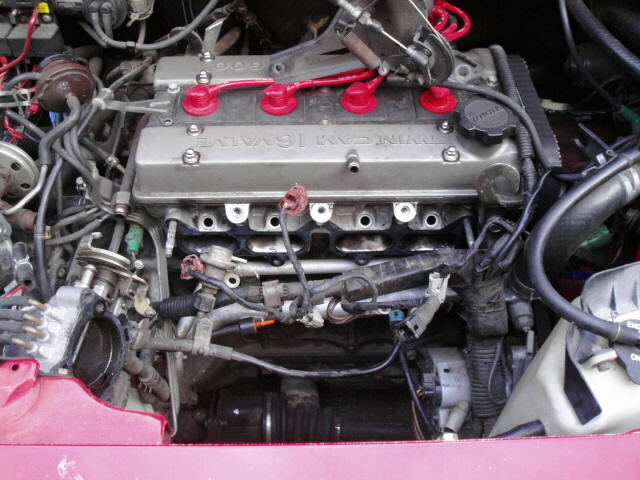 Performance with a bigport head would probably be better if the smallport manifold were ported to help bring the intake charge to both inlet valves, but you could leave the manifold as-is if you want to use it later on a smallport head. If I were to do this again I would port deeper and wider into the manifold, making the port wider, but would ignore the roof and floor so as not to make it any taller.